Tomoko Taniguchi is popular in the United States for her touching, romantic teen stories. "Call Me Princess" introduces Makoto Takenouchi, a girl with a happy family life. Manga with metalheads -- what more could you ask for? Looking at the works of Japanese comic artist Tomoko Taniguchi that have been released in America so far, one might wonder what her seeming obsession with heavy metal is. Then again, her stories date from the 1980s, when metal culture was in full swing. In any case, Taniguchi has made a name for herself in America with her stories of love and romance, full of '80s references and metalheads -- enough to make you wonder: What's up with that? Most of her works have been published stateside by CPM Press. As a bonus for U.S. readers, Taniguchi wrote author's notes exclusively for several of the CPM publications, with tidbits about her life and elaborating on Japanese and other rock musicians. 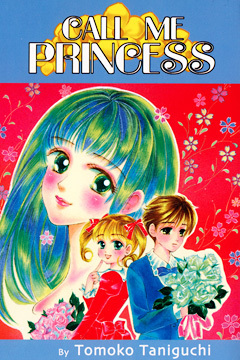 Taniguchi's first U.S. release introduces Makoto Takenouchi, who has a happy family life, with a brother-in-law she adores and whom she considers the ideal man. After her sister Shoko and husband Shin are transferred to Hawaii, Shin's teenage brother, Ryu, moves in with Mako and her parents. Ryu seems gentle enough, and Mako is instantly caught by his striking similarity to Shin. But it's rumored that he's a delinquent who picks fights. Mako later finds that Ryu hates his brother: The two were split up after their parents divorced. Ryu was left with his uncaring mother; Shin had a happier time with their father. Over time, Mako sees another side to Ryu that makes her like and respect him more. Ryu realizes he has people who care about him, and everything turns out happily. This collection of three shorts starts with teenager Naoka Uchiyama in the title story. Naoka visits the aquarium daily, wishing she could be as carefree as the ocean creatures. It is her way of coping with the disappointment of failing to get into the high school of her choice. One day, a boy notices her absentmindedly staring at the eels and starts making small talk. She tries to brush him off, but he's persistent and introduces himself as Haruki Usami. But when Naoka sees Haruki buy a rose for another girl, her feelings of self-loathing -- fueled by envy over her sister's success in school and innocent comments by her classmates -- drive her over the edge, and she slits her wrist in the aquarium bathroom. She recovers, gets to know her classmates better, realizes her new school isn't so bad and also comes to accept Haruki's affections. Naoka's desperation adds a tragic depth to "Aquarium" that makes it the best of Taniguchi's works. The author mentions that many young readers wrote to her saying they could identify with Naoka and were encouraged by the girl's strength. CPM re-released this, "Call Me Princess" and other early Taniguchi manga first as smaller-size books, then in the original right-to-left format. Four of the five stories in this book feature high school metalhead Leo and his friends. The title story, "Let's Stay Together Forever," is actually the last in the series, but at Taniguchi's request it appears as the first story in the book. Shy teenager Ayami Arii feels out of place when the new school semester starts and she's separated from her best friend. But the popular, outrageous and handsome rocker Leo is in her new homeroom and does his utmost to help her fit in. Their feelings for each other are hinted at throughout the book, and "Together Forever" finally brings them out into the open, but Ayami still has to overcome the rumors that spread about her before they can really become a couple. The last story, "Wonderful Crush," involves love triangles up the wazoo: Yuri has a crush on the athletic Mouri, while popular bookworm Miyahara secretly loves Yuri. Meanwhile, the outgoing Sanae also has her eye on Mouri. The four friends go to Tokyo Disneyland, where Mouri confesses his love for one girl -- and Miyahara is there to comfort the other, heartbroken one. Teen rocker brothers Ryouta and Zenta Yamazaki are just about to debut as solo artists when the frail Zenta collapses onstage. To help him recover, the boys head to their grandfather's farm in the country. They hear the area is set to become a golf course, and their grandfather is under intense pressure to sell. The brothers are torn by the news. While the younger Zenta craves the limelight of the stage, Ryouta has never forgotten his childhood promise to take over the farm. But he also has a serious girlfriend back in the city, and he has yet to tell his brother that his condition is chronic and the stresses of the stage will only shorten his life. Eventually, Zenta reconciles his love for performing with life on the farm, and both brothers realize their dreams in the country. This happy ending holds special meaning for Taniguchi, who explains that her own family's farm met the fate of being turned into a golf course. Even the most open-minded readers might be taken aback by Zenta's strong feminine tendencies, which go beyond a preference for makeup and long hair. The boy's artistic side leans toward elaborate girls' outfits, and he often performs in those getups. Even in the most tender moments, it's difficult to take Zenta seriously when he looks and dresses the way he does. This book includes an extra story, "The Magic of Love," in which high-schooler Yume constantly worries about pimples and washes her face whenever she can, convinced that no boy could ever fall in love with a face covered in zits. It's the usual lesson in "beauty is more than skin deep," but while it builds up in the usual manner, its abrupt ending leaves readers hanging.